On a warm summer night in Paris, my good friend and gifted cook Brigitte Bizot brought out a bright orange soup of puréed red bell peppers. When I asked for the recipe, I was surprised to learn how simple it was. I made it several times, eventually embellishing it with scoops of a refreshing crab salad. The seafood counters the peppers’ sweetness with its citrus accent. You can serve this soup warm, at room temperature (as my hostess did), or chilled. Stem the peppers then quarter them lengthwise. Cut out and discard seeds and membranes. Slice peppers lengthwise into ½-inch-wide strips to yield about 5 cups. In a large, heavy pot over low heat, melt butter. When hot, add peppers and stir to coat well with butter, 1 to 2 minutes. Cook, stirring occasionally, until peppers are very soft but not browned, 45 to 50 minutes or more. To serve, fill a ¼-cup measuring cup or a small ramekin with crab mixture and unmold in the center of a shallow soup bowl. Ladle some soup around the crab mixture. Repeat to make 5 more servings. 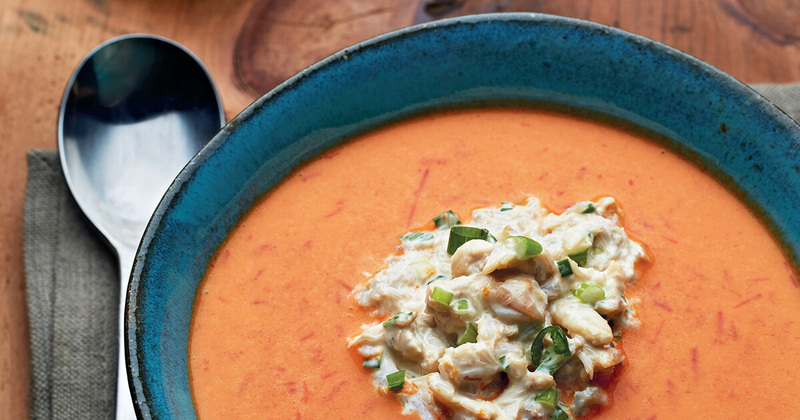 Bring a taste of summer to your friends’ and family’s long winter nights with this pepper-filled, crab-topped soup.